Home » Website Building » Weebly » How to Embed Word, Excel, PowerPoint and PDF in Weebly? Document embedding is very useful especially for sharing your own and other’s documents on your site. You can easily embed any of your favorite documents relevant to the content on your site. Weebly offers multiple options for embedding Word, PowerPoint, Excel and PDF documents. Here we will check out those options for embedding different types of documents in free Weebly site. Before embedding any documents, remember that search engines will crawl and index the content of the documents being it is a PDF or Word file. There are two ways to embed files on your Weebly site. There are three options available to embed documents which are uploaded and stored on your own Weebly site. 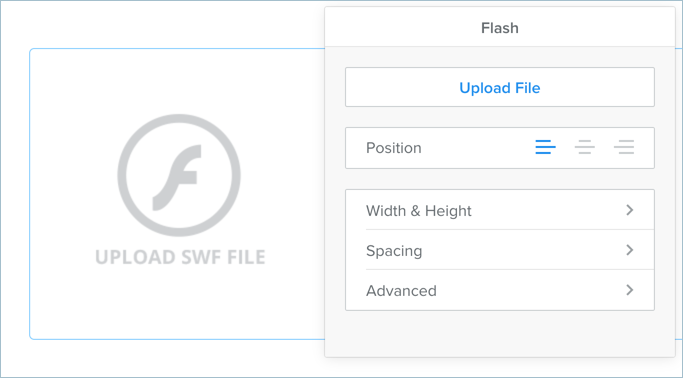 Weebly flash element allows you to upload SWF flash files. The uploaded file can be viewed on the browser directly. We do not recommend embedding flash files, as flash files can cause security issue and not supported by browsers like Safari. Since Adobe also will stop Flash support formally, we also expect Weebly will remove this element soon. The second option is to hyperlink the uploaded PDF file on text and image content. Highlight the text or image and then click on the hyperlink option to view the “File” option. You can either choose one of the files already uploaded on your site or upload a new PDF file. Also there is an option to open the file in new window when the user clicks on the link. The file element allows you to embed all types of files like Word, PowerPoint, Excel and PDF. It will only create a download link with the icon and will not show the content of the file directly on your site. PDF files are generally opened on the browser window while other files like Word documents are downloaded to your local computer. There are numerous options available to embed any type of files from third party sites. 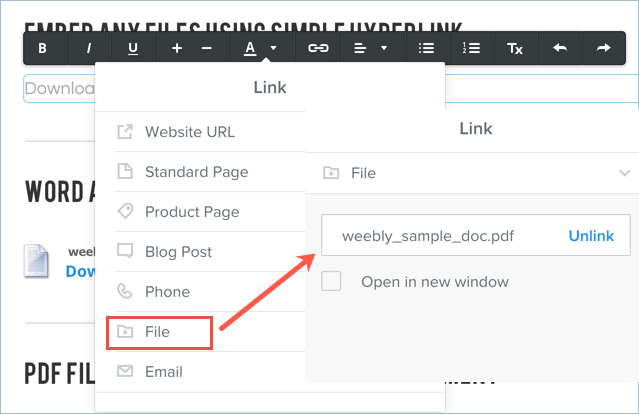 Weebly also offers document element to embed PDF files using the Scribd document embedder. Document element only supports PDF files and host the uploaded files on Scribd.com. 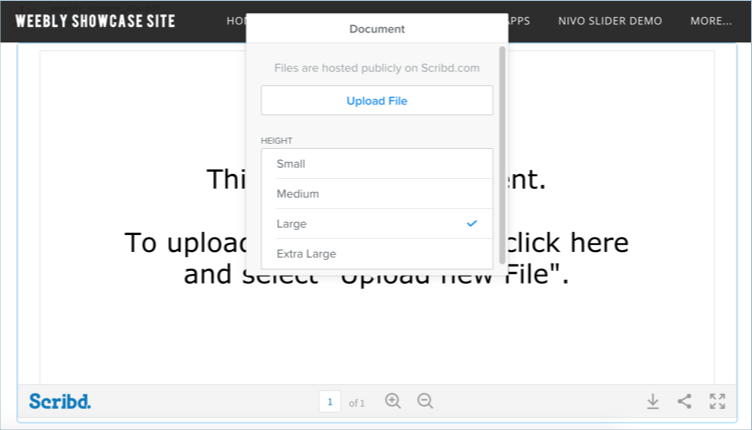 Though Weebly allows to show the download option in the document viewer, Scribd does not allow the document to be downloaded as the documents are saved under private mode. Instead of using document element, we would recommend creating account with Scribd.com and embed the PDF file using embed code element. In this way you can get the complete statistics of file views from your Scribd account which is not possible with Weebly’s document element. The other popular options are LinkedIn’s Slideshare.net and Google documents. Slideshare.net is useful only for embedding PowerPoint presentations. Google allows embedding documents, sheets, presentations, forms and calendars on your site using iframe embed. But the problem is that Google is blocked in many countries. If you have users from those countries then the embedded documents can’t be viewed by the users.